Dylan started his new job today. It's got me thinking about how we ended up here. 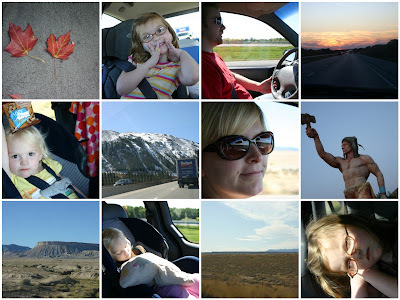 So I compiled these photos from our trip across the country last fall. It was a rough trip, but these photos make smile. Over the last few months we've gone through a lot of unexpected feelings. Anger & depression over the loss of Dylan's job. Uncertainty about where the future would take us & where we would be living. Figuring out how to best share the responsibility at home. Just as soon as we worked though all of that & figured everything out, it all changed. Thanks to all of you lovely readers that have offered support & prayers for us. We appreciate it, for sure!! Such a journey you've been on. Happy, happy that Dylan has a JOB! those pictures make me smile!you've come a long way in just a few short months!!! Im so happy for you guys!! Good luck in your NEW journey! Smile through it all...life goes by too fast! i have been thinking about you guys all day!!! i hope his experience is AWESOME and I know you'll get in a groove fast, you're awesome that way. Candace, I totally missed the post saying that Dylan got a job! YAY! I am so happy for you guys! !